NaBloPoMo: Pretend it’s November 1. USE IT OR LOSE IT, SMITH. Who would you like to see speak at a TEDxWomen event (even if it is a special set-aside event for women, when they should be working on changing the ratios at their flagship conference)? And, they asked, “what woman in your life do you feel is a force to be reckoned with in this society and why?” I rattled off a ton on Twitter and would love to hear who comes to your mind. I happened to get together Tuesday evening with Natalia, with whom I partnered to produce a TEDxWomen event last December. She runs the Pipeline Fellowship, which trains emerging women investors to support women-led startups. If you are in NYC or Boston and have any interest in learning about angel investing, check them out. And then I got to spend some time with Raylab. Do you care about immigration? You should be following her. Do you care about having fun? You should be eating delicious curry with her at The Islands. Wow. More like National BRAG Posting Month. I feel very lucky to be surrounded with trailblazers like these. 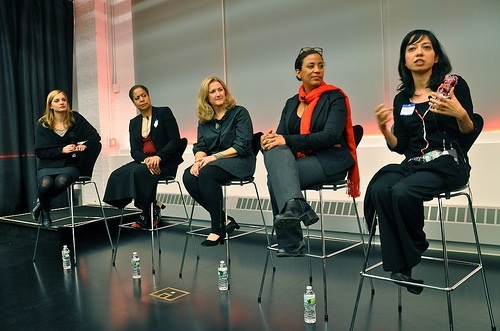 Photo: Brittany McCandless, Adaora Udoji, CV Harquail, Liza Sabater, and Ritu Yadav speak on the #morevoices panel after TEDx636EleventhAve last year. This entry was posted in People, Projects, Revolution. Bookmark the permalink.